Seeing as we’re discussing a medium where resurrections and such are not uncommon, for this discussion, read “death” as the permanent removal of the object, PC, or NPC in question. Did the player bring this on themselves? Sometimes players make very stupid choices: remaining in combat while very low on health, picking fights with creatures several levels too powerful for them, blithely ignoring NPC warnings… I myself once played a character who had been blinded and had to traverse a slippery ledge under a waterfall. I chose to take this at a full run, which prompted a saving throw vs death. Had I failed it, I would have deserved my fate. How unlikely was this roll? This is somewhat related to the above question, but focuses on the killing roll itself. Even if a PC is charging into combat low on health, there’s a difference between being crushed by a hill giant, and having a goblin warrior 10 levels below them getting a lucky critical hit. It’s hard to argue the former shouldn’t kill a PC, but the later just comes out of left field. How badly did the roll go? Did the player miss his saving throw by one? Did the goblin’s damage just put him past dying and into dead? 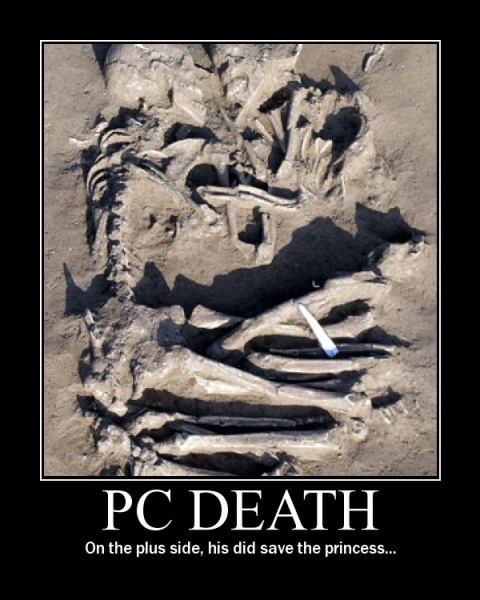 It’s easier to justify saving a PC over a close roll than one that killed him several times over. Would this be a dramatic death? It’s easier to let a character die if they’re killed by the Big Bad (or one of his lieutenants) than if they’re killed by a random encounter the party ran into on the road to the Big Bad’s lair. Can a new PC be put into the party at this point in the story? Practically speaking, even if the PC dies, you still want their player to be able to continue in the game. This can be difficult if there’s no real way for them to have a new character in the near future. If the PCs are going to be heading back into town next session they could conveniently find a new friend then. If they’re crossing the Lifeless Plains of Leng which no man has dared for centuries, it can be hard to justify them coming across a new PC for several sessions. Use bad strategy? If the GM is canny (and lucky) enough, they can see a bad situation coming before it kills someone. If the PCs are charging into the wizard’s lair hurt, tired, low on magic, and with no coherent plan, maybe the wizard doesn’t throw around lightning bolts like you’d been planning and sticks to his lower level spells. Offer a reroll? In the above example of my character running along the slippery ledge, had I failed my save and the GM still didn’t want to kill me, he could have had me make another save to grab a branch on the way down. Or given one of the other players a chance to grab me before I fell. A PC who had died of a goblin stab wound could be saved by quick medical attention. There’s usually some way to give a PC a second chance. Fudge the dice? Most GMs make their rolls behind a screen. So, if the goblin warrior inexplicably rolls a critical hit, the GM could pretend that the goblin only hit for a little damage, hurting but not killing the PC. Maybe my reckless ledge-run had a lower difficulty than I’d thought. Done carefully, the players may never know they should have died. Takebacks? Or maybe now that the player knows that course of action could really result in death they want to go a bit more slowly over the ledge, or maybe that goblin warrior should have attacked a different PC instead. Taking back the deadly roll and doing something less likely to end in PC death is the most radical of the “save the PC” options, and should be used with care. Let the dice decide? Sometimes the PCs lose. Sometimes they lose big. And maybe that’s part of the fun of roleplaying. After all, how often do we risk death in real life? Hopefully, the GM knows ahead of time how they’ll handle this when it happens, because this is the death scenario most likely to come out of the blue. The question they should already know the answer to, before any of the above can be asked, is how much do they want to protect the PCs from the results of their own actions? And it is not necessarily wrong to say that the PCs should be absolutely protected. This is not the enemy. For some players, losing a character stops the game’s fun. 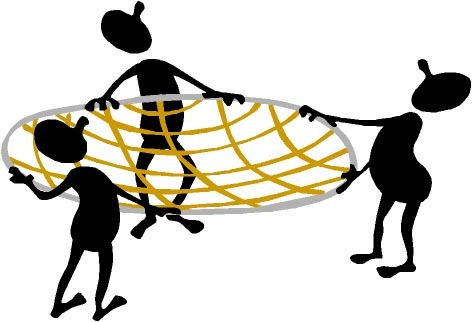 Some players would rather have a safety net, because that net allows them to try things that they wouldn’t want to otherwise out of fear of losing the character (and trying things that would reasonably get you killed is definitely part of the fun of this hobby). Playing careful, conservative characters can be fun every once in a while, but, most of the time, you want to be the Big Damn Heroes, running in guns blazing. On the other hand, some players want to know that their actions have consequences, and have more fun when their characters are really at risk. High wire tricks at the circus are far more exciting when they’re performed without a net. Poker without betting is a boring experience. Having a beloved character’s life (or even the fate of the world) resting on a single die roll can be an incredible rush, because when you win, you know that that win meant something. I’ve run games both ways. I once ran a short World of Darkness mortals game that only spanned three sessions. I needed the PCs to survive the first two sessions because I didn’t want to spend time introducing new characters in the short amount of time the game had. So, I avoided taking actions that were likely to kill the PCs. Enemies spread out attacks between the PCs instead of concentrating on them one at a time. There was a monster that zombified people it bit. Whenever this type of monster attacked an NPC, it tried to bite, but PCs only got clawed or grabbed until the third session (game 3, I gleefully went in for the kill). I never had to deal with an unlucky death roll, but I probably would have offered a reroll or fudged the roll if it had come up before session 3. On the other end of the spectrum, the year I was a Storyteller (GM) for Dead City Productions, three PCs had a group of powerful enemies from their backstory after them (for those who are familiar with the system, each of the 3 PCs had taken 3 points worth of the Enemy flaw). One session, an agent of these enemies came to town to kill them. The players did everything right, rallying most of the other players behind them before they confronted the enemy agent. The agent still managed to incapacitate one of the PCs. I could have left it at that, but I decided that it only made sense for the agent to coup de grace the fallen PC. All the unintended results of that action are a story for another day, but in that game, player agency was very important to us. If I’d let the PC live, it would have undercut too much of what we were doing. In the end, where PC death winds up on the agency scale depends on the game you’re running and the group you’re playing with. How important is protecting the PCs lives? How much do you (and they) need their actions to have consequences? Experience and familiarity with your fellow gamers is the best way to find where this line should be, but flat out asking what everyone’s opinion is certainly couldn’t hurt. The important thing is to be consistent with whatever you decide. Next week, I’ll go into the other kinds of death that define player agency in a game (because this post is too long as it is). Posted on April 13, 2011, in Examining Player Agency, Roleplaying and tagged agency scale, Dead City Productions, Death, From Blogger, Gamemaster, Player Agency, Player character, railroading, Social contract, World of Darkness. Bookmark the permalink. 4 Comments.